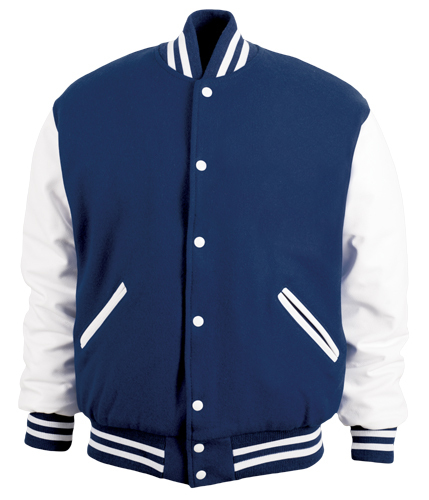 All of our jackets are made to order by Game Sportswear NY. Call (425) 355 - 5997, text (425) 344 - 7453, or email jackye@jackyes.com to schedule an appointment with Jackye! Come visit our showroom for sizing and color selection! Font samples will be available before or after appointment for customer approval. Payment in full is due when you order. Turn around time is 4-6 weeks if the jacket is in stock, 8-10 weeks if not. 8-10 weeks for custom sizing/color combinations. Holidays may increase lead time. When the patches are complete and pinned to the jacket, the customer will be contacted to make an appointment for final fitting. The customer will try on the jacket and patches will be adjusted as needed. After final fitting, your Letterman's jacket will be sewn and ready for pick up in 2-3 business days! Turn around time for jackets purchased through Jackye’s is 1-3 weeks! ***We are currently not accepting updates for customer-supplied garments or jackets purchased through another company. The leather sleeves continue to the top of the shoulder, connecting to the collar. Sleeves are set in the wool material that makes up the body and shoulders. A slim-fitting version of the set-in sleeve style.